Can this be used to decode the analog signal into separate audio levels? I want to create a standalone equalizer. Hi, maybe somebody can help me here: do i need to use pull-up resistors or any capacitor between the data lines connected to the mux and vcc line and/or the scl lines? either between my sensors and the mux or between the mux and arduino!? Thanks. is there a way to connect it to a raspberry pi 2 and read 16 analog devices ? and if yes how ? or could i use the MCP3002 on the SIG of the CD74HC4067 and read analog on my raspberry pi 2 ? Ok, I've been trying to get this to work and am failing. I can't get it to switch inputs. No matter what, I just get the input from C0. EN is set to low, and I'm pretty sure it's all wired right. Is there a need for a delay or something between switching inputs and reading that input? Does EN ever need to be set high? I'm trying to wire this thing pretty simply to an Arduino. Are there any sample schematics or code to show how to use this? Wrote some (untested) arduino code. http://pastebin.com/JjV1pj9m Just hook the thing up to VCC, GND, and hook up S0-3 to digital pins 2-5. No clue if it'll work yet, but eh. How can I hook-up 8 rotary encoders with this? It sais it handles digital signals as well. Has anyone used this for selectable output? Do the output pins have memory of what they were set to? The datasheet is kind of lacking in that info, maybe it's [un]common knowledge what I'm asking? I'm trying to attach many simple on-off devices to an MCU but I'd like to know if I have to put in an output buffer or flip-flop or something. The linked one looks like it's Parallel to Serial, but this one looks like it's going to be exactly what I need. I got scared at "shift register" thinking I was going to cycle through all switches to turn one at the end! 4 years late but maybe someone will read this. What you really want is an "IO expander". I had trouble with this for a little bit so I'm posting it if others want to know. The S0-S3 act as an address so if you're measuring multiple inputs coming from the C0-C15 side you set S0-S3 to that binary pin # and read it on the SIG pin. I had assumed that a 1 on say C8 would generate a 1000 on the S lines. In this instance you have to set S to 1000 and then the value reads in on SIG. Just for anyones info if they were having problems like I was. I didn't quite understand that from the data sheet. What is the bandwidth of this board? Impedance? Could this be used to switch video? What about using 5 of them to switch RGBHV(Say XGA) video? Data sheet says 70 ohms typical. Bandwidth will be limited by the output load's capacitance. Might work for video with short cable length. It doesn't look like they sized the traces for 50 or 75 ohm impedance, but the trace lengths on this tiny board are very short so that shouldn't be an issue. 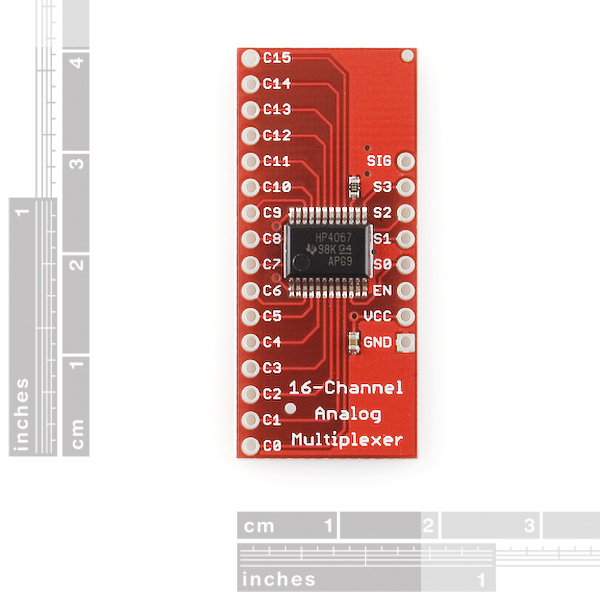 I can't recommend this multiplexer highly enough. Love you guys ;-) Keep up the good work! Thanks Zerk! We're building them as quick as we can. We never gauge new product demand correctly, but our production dept usually catches up within a week or so. Why not use the DIP version? Is the DIP version not available? Good question - both TI and NXP make a DIP version available from Mouser and Digikey. This was created for a friend who needed to solidly connect a bunch of sensors to his Arduino and didn't want to add a breadboard to his setup. The eagle files show a pair of standoff holes on this, but the pictures don't. Does it have standoffs or not? I want to use this board to send pwm outputs and read analog inputs. Is this possible? for example 10 pwm outputs + 6 analog inputs = I have read a few the bildr tutorial and it talks about using this multiplexer for sending 16 pwm outputs or reading 16 analog inputs but not both. Hi, is this board able to drive multiple I2C sensor, that has the same address, on a single channel? 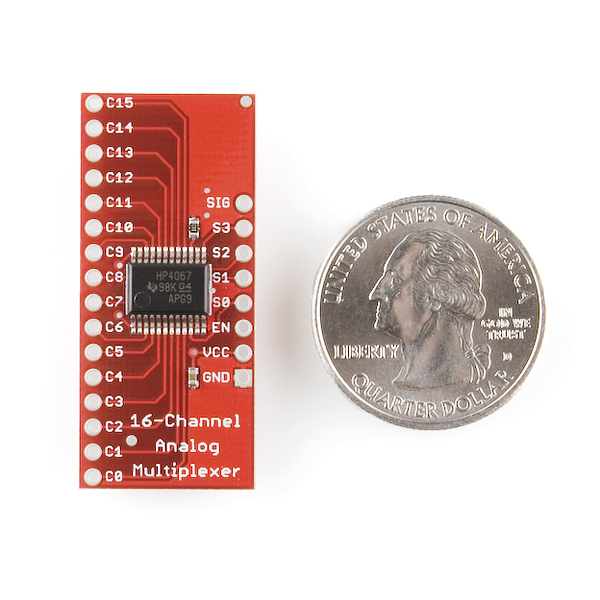 I would like to hook up to an Arduino, 8 IMU-6050; but the chip uses only 2 address for the I2C channel; so I am looking for a mux that can do the job. Is this one able to do so? And if it is the right tool for the right job; is there any example code to learn how to probe each sensor at specified interval? Thanks! No wonder I cant get my keypad to talk to my Arduino. I thought the enable pin was active HIGH based on the silkscreen. It really nees that little bar above "EN" to denote this. Does anyone know if there is a fritzing part for this? I could not find one and would like to include in my breadboard view. Will this board allow me to get analog readings from an analog sensor? For example, if I'm using a Force Sensitive Resistor (like this https://www.sparkfun.com/products/9375), can I get a value from 0-1023? I initially started using a different chip (the MCP23017), but quickly learned that, while it says it is for analog and digital inputs/outputs, it can only return digital readings -- so I'm only getting a 0 or 1 from the Force Sensitive Resistor. It looks "wierd" to me too, we'll get it fixed. Thanks! While I might have drawn it differently (first thing would have been moving the internals of the chip around and probably mirror the entire thing), in what way is it weird? Let's say I have a matrix keyboard, where connecting line X0 with line Y0 results in a keypress. Pretty standard part. I connect all the rows/columns, one each to a pin on this or similar multiplexing chip. Is there any way, with one chip, to connect those pins to each other? I figure I can do it with two mux ICs, one for columns, one for rows, joined at their common I/O pin, but I'm trying to save room and parts by trying to combine that into one chip. If not this one, then maybe someone can recommend one? I need an 8x10 matrix. Can this be used to control a 7 segment display? Or would it be better to use 2 shift registers? I think the main question is about the you can switch the digital writes on this. Hi, I want to use this board for connecting multiple micros to one master micro using serial pins (tx/rx). One board for each signal, will this work ? You got it! One board for all the TX lines, and one board for the RX lines will work. Just make sure you match your logic levels. Ok... Have I been going about this all wrong? When using this chip to read multiple sensors (switches) I have been pulling each of the 16 inputs low with a resistor (one for each pin) which is a total mess, especially when piggybacking this on a protoshield (leaves no space for... anything else.) and then something donned on me: Can I just use 1 resistor to pull the SIG pin low and let the switches float? This would save a lot of time, space, and resistors! Would anyone know how to wire this to a clock so it cycles automatically? If you are asking if this connects in a similar fashion as the 4051 then, the answer is yes. This is the big brother to the 4051. So in theory then, I could have one connected to the arduino with 16 chained underneath it? Similarly to how the example I shared does for the 4051. This indeed makes me happy. How do you use this with SPI? Don't see anything in the datasheet about how to connect this.. Right, thanks! I read the description a little bit too fast..
what are the two surface mount components on break out board ? are they by decoupling capacitors ? One is a pulldown resistor on EN. The other is a .1uF capacitor. Look at the schematic for more information. Bought one of these recently and ity works great with 16 outputs. 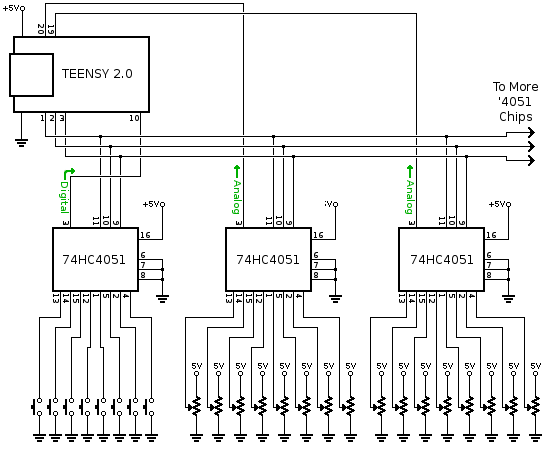 Is there any way of using a second Mux (with an Arduino) to get 32 outputs? These boards can share most of their pins. They can't share EN pins though. Why not just buy it in a DIP package? would this work for demuxing a DAC? in other words, if i connect my dac out pin from the ARDUINO to this, could i get 16 channels out? is there code for using this thing? Can this be used to send audio from a computer headphone output directly? Does this come with the CD74HC4067 or is that to be soldered onto the board by the buyer? Can it be used for +/-5V analog voltage range with single supply? Thanks. The schematic does not match the labels on the actual board. What is up with that? Which is correct? So I want to connect 16 push buttons to a arduino nano using this shield in such a way it would read simultaneous presses. Can This be used to MUX the digital inputs on the arduino or do I have to wire resistors up to the buttons and go via analog?? is it necessary to tie unused inputs on this MUX to ground? Yes you have to plug any unused channel selector IO pin to ground. can you do analog and digital at the same time on this board?. ... like if i wanted to split it up as 8 digital and 8 analog inputs? Sure, just keep in mind that all the I/O are muxed to a single O/I pin, so make sure that pin can handle either source type. Is there some reason that this board doesn't have mounting holes? It would make it just a little more convenient and look neater then when I am going to have to put them in. Would this work for piezo's on an arduino based electric drum set? I need more analog inputs than just 6 and can't afford a arduino mega. Be careful and inspect your boards when you get them. I spent a good few hours debugging what I thought was a flaw in my looping algorithm when it turned out that two of the legs on the MUX chip were just barely soldered together causing one of the digital pins always to return a 0. All it took was a little bit of scraping with an exacto knife, but it took hours to track down. 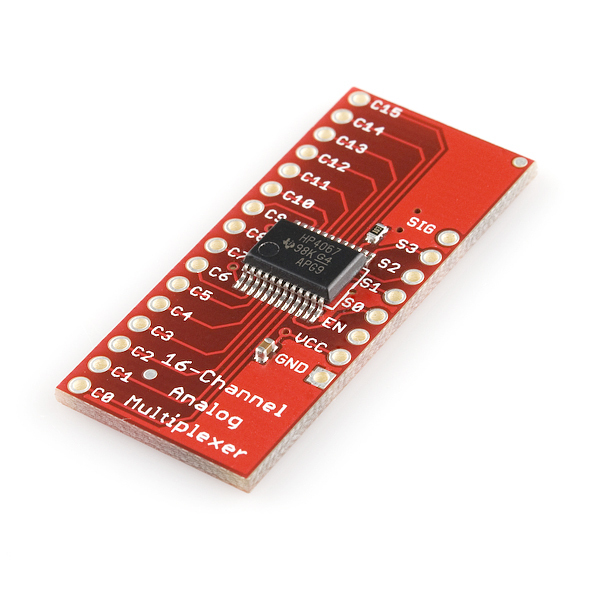 silvap: Cant this multiplexer board drive servos? * i mean "can" instead of "cant"
Can this multiplexer board drive servos? Cant this multiplexer board drive servos? No, it would not be able to drive multiple servos. This is used to connect 16 analogue sources to one A/D pin. Besides, servos need constant attention with their signal to work properly. You can use something like the Serial Servo Controller or convert some servos with the OpenServo boards and control them all with two lines with I2C. In case anyone is looking, here's a really simple diagram for hooking this up. Haven't played with mine yet but I believe you connect pin 1 to your analog input pin and then connect 10,11,13,14 (S0-S3 in the data sheet) to digital outs, and then use them to select which of the 16 input pins is passed to your mcu. Use page 2 of the data sheet to see how to select pins. I built a 64 channel (open ended) data logger with a logger shield/RTC, Arduino Uno 3, and 4 of these multiplexers. The operation was good. hookup was straight forward. It is important that all inputs are fed by something. then all data reads correctly. But if inputs are left floating, the previous will carry to those floating channels. Seems the charged common circuit bleeds off previous data form other channels. ie. channel 0 is 2.35VDC. channel 1 is floating but reports 2.23VDC, channel 2 is floating but reports 2.15vdc. Unless told to do otherwise successive charge gets blead off via 70 ohms of internal resistance. SO....(correct usage) either ground unused channels or connect them to something meaningful. oh and... outputs can be ganged together on a single Analog input as long as only 1 channel is selected and read at a time. It relies on PORTB for convenience. Use this to read sixteen inputs or to control sixteen outputs (or any combination thereof) using only six pins from you micro (five pins if you hold EN low via hardwire). I used it to read buttons from a number pad. I was completely out of COM ports for an application that I was building on my Netduino 3. This thing saved me as it basically added 16 more ports to be available for my microcontroller; for bidirectional Tx/Rx communication you would need to use 2 chips. I adopted the code from the posted bildr article and Arduino to suit the .NET micro Framework and uploaded the source code to my github account https://github.com/JakeLardinois/NetduinoMUX. It's a very useful device to control 16 things with 5 pins. It works perfectly fine to me! The code is for this is available and works well. Easy to solder and wire up. Does what it is supposed to and the TI chip is very fast. Made it easy to integrate the TI SMT part on my THT board. It is a very good part. The CD74HC(T) is a great part for a little port expansion. If you are looking at multiple sensors and are not using an interrupt driven program it works well. 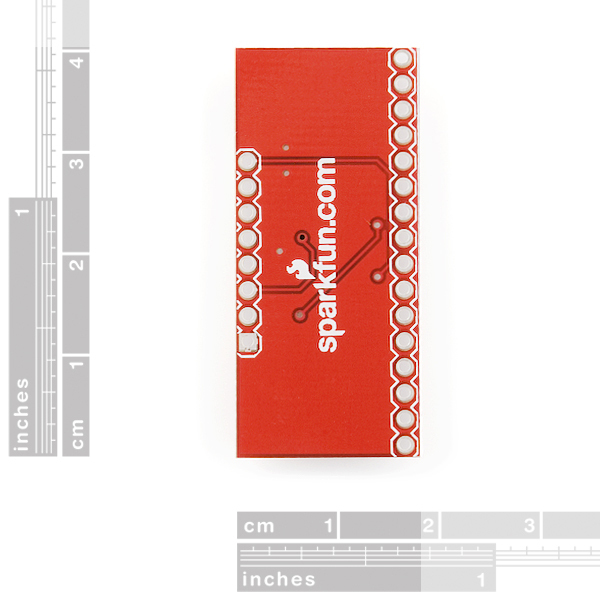 I wish SparkFun would use FR4 circuit board material though. This product has worked perfectly for my project. It is extremely easy to use and is one of the most useful breakouts I have used. Like all of SFH products. Easy to work with & great TUTORIAL support! Def Thumbs UP!! !